For thousands of years, people have held the belief about martial arts. 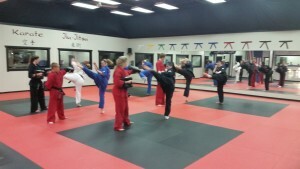 It develops stronger character, creates joy in life, and, of course, teaches a powerful self-defense technique while become very physically fit along the way. Martial arts presents you with all kinds of challenges. But we’re here to help you through each one. Community is a huge part of UMA schools and who we are as mentors. We’ve created an environment here that fosters friendships and support. Students of all ages (and their family members too!) make new friends, form bonds, and help each other learn and grow.